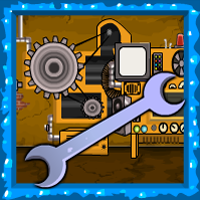 G4E Rustic Factory Escape is another point & click escape game developed by Games4Escape. In this game, you have entered a rustic factory, but unfortunately the door got closed. You have to find the key to get out of the factory with the help of useful objects to interact with and by solving puzzles. Good luck and have fun! I really enjoyed that, although I had to switch off the music! Puzzles straight forward and logical! Number on dials for 8 digit panel in room in the far right.